Hello from Joel Comm’s exquisitely decorated guest room at his gigantic beautiful house in Loveland, Colorado! After arriving into the Denver airport, I was delighted to be greeted by a towncar Joel Comm had sent to pick me up. The ride was about 45 minutes to Joel Comm’s house, where I met his wife, Mary, and his kids, Zach and Jenna. We soon left for dinner at the Mongolian Grill, where we met up with our graphic designers, Robert Secades and Danny Arzuaga from GraphicMavericks.com. There, Joel Comm also revealed the secret Confessional location from his hit show, The Next Internet Millionaire. Following dinner, we returned to Joel Comm’s house, where we spent a little time in his home office talking shop. That conversation quickly got boring, and we decided to play some video games in his basement instead. Turns out our video game of choice is more like a mix between live band and karaoke, as we rocked the house with “Rock Band” for PS3! It was a good time… and I think we each discovered some new talents (and new hobby when we retire from Internet Marketing haha). After the movie, Joel Comm needed to work on his next issue of his Joel’s Tips newsletter, so we called it a night while I made myself at home in his beautiful guestroom. If you’re on Joel Comm’s list, you would’ve seen that this week’s Joel’s Tips talks about his Joel Comm Live show that he has every Wednesday at 1pm EST. I got to spend the rest of the day with Joel Comm at the InfoMedia Inc. office, which was a very impressive operation. Joel Comm And Simon Leung At InfoMedia Inc. Together with his team, we hammered out some cool projects we’re going to be working on together in the upcoming months, so definitely stay tuned for that. I’m still trying to catch up after my Nashville trip from over the weekend. I really enjoy going to live events because of all the wonderful people I meet there. But most of the time, it is usually the successful networking at these events that contribute to my backlog because when I get home, I am often greeted by dozens of emails in my inbox from the people that I met. Now don’t get me wrong – I love to hear from people and in fact, I would prefer it, since I am so busy that it really helps me out if someone follows up with me. The only challenge is that I have to spend a lot of time sorting through my email and replying to them after I remove the junk email and separate the business emails from the personal ones. That’s why I was so excited when my friend, Joel Comm, sent me an Instant Message the other day to tell me about a super cool new script that will solve this problem completely! 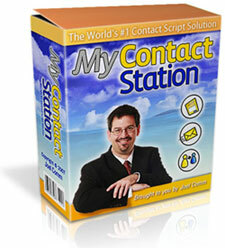 It’s called My Contact Station and it’s basically a website contact solution that installs onto your website easily in just 10 minutes.